What is exactly is building a base? In the previous parts of this series, we have looked at what makes a content marketing strategy successful, and how to start with two critical steps: finding the sweet spot and identifying your content tilt. Summary: We showed you how to find that area where your knowledge and skills intersect, positioning you and your brand for becoming a leader in your niche. However, finding a sweet spot and the topic you will explore in your content isn’t enough on today’s overcrowded content market. Everyone is busy creating content so you can be sure that other companies and individuals offer a similar angle on the topic. That’s where content tilt comes in. It helps brands to identify the particular perspective from which to attack an issue, offering them minimal or no competition at all. If you’ve followed the steps outlined in the previous parts of the series, you probably have already identified your sweet spot and know what you’re going to write about. You have also defined your content tilt: the particular angle you will explore in your topic. Now it’s time to choose your primary content type and platform – otherwise known as the base. In this article, we show you what building the base is all about, how to do it, and what it looks like in practice on some great examples. Building a base involves choosing one preferred content type to work with and deciding on one content marketing platform on which you will deliver that content consistently over a specific period of time. and doing that over a period of time. But there’s one thing you need to do before building the base for your content marketing strategy. When creating content, it’s essential that every article, video, or podcast is directed at the objectives of your company. A content objective is nothing else than what you want your piece of content to accomplish. For example, your content can reach a targeted target audience, promote an event, drive sales, build registrations to a webinar, or even influence the decision of a business unit. In general, it’s best to relate your content objectives to both your business and audience objectives. Business objectives – this is where you make sure that the content you create brings value to the overall goals of your business and its key performance indicators (KPIs). For example, if your goal is increasing sales by 5%, do you know how many leads you need? And how can you generate that number of leads using your content? Audience objectives – you’re creating content not only to serve your business but your audience as well. Good content always serves a purpose for the audience, be it solving a problem or showing a more efficient way of doing something. If you have no idea about what your audience is experiencing and what their primary pain points are, your content will never work. Create content that matches audience objectives – it’s useful, and that helps them to take action relevant to their goals. Defining your content objectives is critical at this stage because they will suggest the types of content you should be creating. Here’s an example: If your goal is building brand awareness, some of the most efficient content types for that goal are videos and infographics. But infographics won’t get you that far if what you want to do is drive demand or motivate people to subscribe to your newsletter. Now that we got that out of the way let’s focus on building the base. 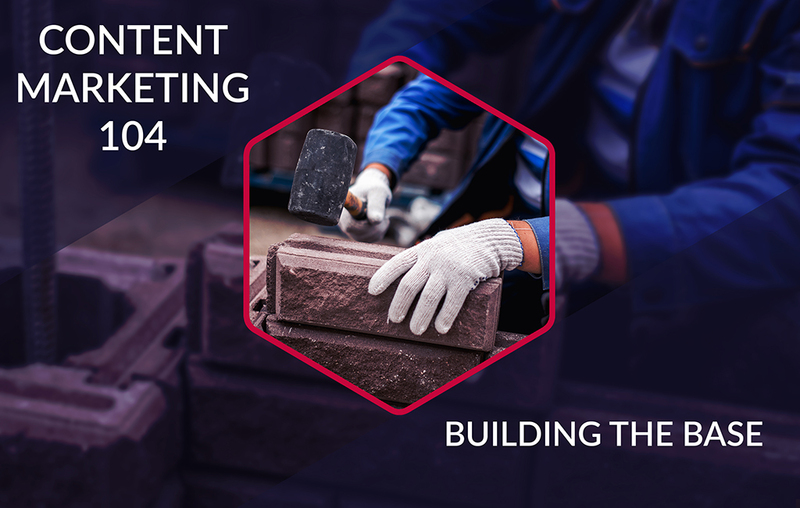 Here are four essential parts of the process of building a base for content marketing strategy. There are plenty types of content you can choose from: text, audio, visual, or video. We’re talking about webinars, emails, blogs, videos, infographics, and many others. The idea in this point is that you ask yourself a question about what type of content you can excel at. Will you be able to create and deliver it on a regular basis? Articles and blog posts – the Content Marketing Institute is an excellent example of a successful platform that gained the reputation as one of the top sources for content marketers by providing hands-on guidance on the topic. While at first, they posted three times a week, now the CMI has a new piece of blog content every day – and sometimes even more! Newsletters – an excellent example of a success story related to newsletters is the Social Media Examiner. It delivers content to over 300,000 marketers and entrepreneurs every day. Using the newsletter format, the platform was able to engage and grow its following by presenting their content exactly where it needed to be. Videos – another popular content format is video that can take many different shapes such as explainer videos, live videos, branded product videos, how-to videos, and many more. Podcasts – that one might come as a surprise, but podcasts are incredibly efficient for content marketing and still used by relatively few brands. An excellent success story example is John Lee Dumas, the founder and host all the award-winning business podcast, Entrepreneur on fire. Today, John publishes a new interview every single day. What will be the home base for the content you publish? The second stage of building a base is picking the leading platform where you will host your content for your target audiences to find and engage with. It can be your website or blog. It can be an external platform such as YouTube. Finally, it can also be an online store such as iTunes apps. Depending on the platform you pick, you will need to establish at least one high-level role that will drive your content strategy. It can be a chief content officer who will set, direct, and refine the processes across the entire content team. A high-level role is essential for your company marketing culture to work. You need well-defined processes and a shared messaging system to ensure that your team is able to collaborate. Take a closer look at the unique skill sets of your team members and define roles accordingly. By analyzing their expertise and knowledge, you will be able to pick the right platform for your content – naturally, always in a dialogue with the preferences and needs of your target audience. The third stage of building the base is all about your publishing process. Once you define your content type and platform, ask yourself these questions: can I produce and publish that type of content every week, on the same day and at the same time? Here’s something you need to know: Content marketing requires consistency. And the best way to achieve that without generating considerable expenses is by developing smooth and efficient content processes. Over time, your content team will become more independent and able to create content without the need for supervision. But that only happens when their process is strategic. If you’re not around to approve content, make sure that there’s someone who holds a high-level role and can do that. One of such processes is an approval system for your content. You don’t want to create content that doesn’t match your business or audience objectives, right? You need strategic, branded, and well-positioned content that has a real impact on your audience. And a well-defined content approval process will help you do that in a timely manner, allowing you to publish on a regular basis. Every marketer knows that content takes time to bring results. Prepare for your content marketing strategy to take full 12 months or even more for leading to the first considerable gains. And that’s why you should ask yourself this question: Am I prepared to keep up my content efforts for as long as it takes to get these results and gain traction? The last stage of building a base is important because it combines your commitment with how you will measure your success and track results. You need to keep a close eye on how your content is performing and continuously optimize your efforts to make sure that your audience responds to and engages with it. Building the base is a critical step in the definition of any content marketing strategy. Without asking yourself these four questions, you risk that your content just doesn’t bring the results you want. Do you have any questions about any of the steps involved in building the base? Share your doubts and suggestions in the comments; we’re looking forward to talking with you about this critical step in content marketing.